This workflow is for software license administrators. If you are a software user and you are ready to start ArcGIS Pro with a Single Use license, see Authorize and start ArcGIS Pro with a Single Use license. Before you can authorize ArcGIS Pro Single Use licenses, you must convert some or all of your Named User licenses in My Esri. If you don’t see the Licensing tab, you may not be the administrator for your organization. (In My Esri, "organization" means your business or place of work, not your ArcGIS Online organization. The administrator is often the primary maintenance contact for your organization.) To convert licenses, you need permission from your administrator. On the My Organizations tab, click the Request Permissions side tab. Under Request Permissions to your Organization, click Continue. Fill out the Request Permissions Form and ask for permission to manage software licenses. In the list of tabs on the left, click Convert ArcGIS Pro Named User Licenses. Under Step 1: Select License, scroll through the products to find the one you want to convert. Use the search box or the Sort By filters if you have a long list of products. In this example, there are 30 ArcGIS Pro Advanced Named User licenses. Under the product name, note that the license type is Single Use. The Named User licenses will be converted to Single Use licenses. The version number and license type under the product name apply to the ArcGIS Desktop license as a whole as described in Types of ArcGIS Desktop licenses. 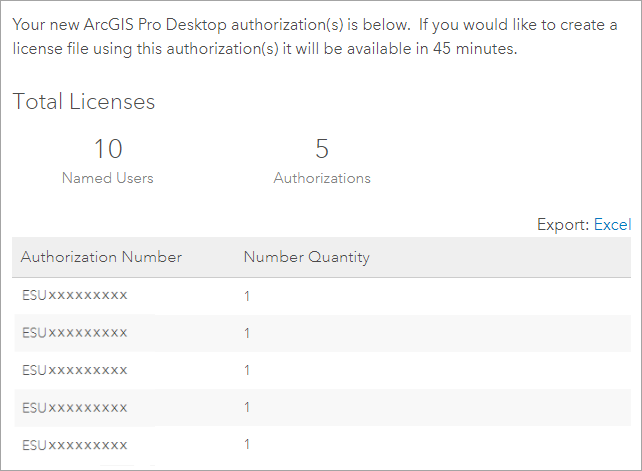 You can only convert ArcGIS Pro Named User licenses to the type of ArcGIS Desktop license that you have. In the Actions column, click Convert. Under Step 2: Convert Licenses, in the Quantity box, specify a number of licenses to convert. In this example, 10 Named User licenses will be converted to Single Use licenses. You can convert 25 Named User licenses to Single Use licenses at one time. If you need to convert more licenses, use multiple operations. Under Step 3: Review, confirm that your settings are correct. If you need to make changes, click Back. When you are ready to proceed, click Convert Licenses. When the licenses are converted, a message appears at the top of the page. Farther down the page, the number of remaining Named User licenses and new Single Use authorizations are noted. The authorization numbers for the Single Use licenses are also listed. A unique authorization number is generated for each license. You will receive an email from My Esri with the authorization number and information about the next steps to authorize the licenses. Optionally, you can click Export: PDF or Excel to save the authorization numbers to a file. You can also see the authorization number by clicking the View Authorizations side tab and clicking Details for the relevant product. Optionally, after 45 minutes, you can create a provisioning file. A provisioning file writes the authorization number or numbers to a file with the extension .prvc. During the authorization process, you can use the provisioning file to bypass most of the steps in the software authorization process. If individual software users authorize their own Single Use licenses, they can all use the same .prvc file. My Esri tracks which authorization numbers have been used and which are available. After converting Named User licenses, you may need to revoke license assignments that were previously made in ArcGIS Online. Suppose that all 30 ArcGIS Pro Advanced licenses in this example were previously assigned to Named Users in the ArcGIS Online organization. Because 10 of those licenses have now been converted to Single Use, 10 Named Users in the organization must have their licenses revoked. As the ArcGIS Online organization administrator, you will be prompted to reconfigure the licenses when you sign in to the organization. You will not be able to take other licensing actions until you revoke licenses as needed. For a grace period of 30 days, all ArcGIS Pro Named Users will continue to be able to sign in and use ArcGIS Pro. After 30 days, if the necessary licenses have not been revoked, all Named User licenses will be disabled until the correction is made.